When this story broke this AM I quickly got on the phone to get as much info as I could. It was not to write a story, but because of family and friends. Pretty much all of my family is from CT and covers almost all of the state. I actually went to HS about 20 miles away from Newtown, CT. I know the area very well from my HS days of going to Brookfield, Danbury, Southbury and all areas inbetween. The news was all over the place and there was a lot of misinformation in the fog of the story. Thankfully, no family members or friends were directly affected; however, like many here, they were just shocked and sickened by the news. My heart breaks for these children and their parents. We do so much work, research, searching for missing children, but this senseless mass murder of little children between the ages of 5 and 10 just devastated me today. My prayers go to the victims, especially the children whose lives were ended far too short. KUDOS to the teachers who were true heroes in protecting and sheltering the children. Sadly, some of them paid the ultimate price, protecting the children with their lives. WHY? It's a witches cauldron mix of things working in perfect synchronization with operatic flair. Just do it. No thought or feeling required. When you achieve that level - you are rewarded with high score creds. one more day - hope and pray things get better. However, when one does that, you are only buying time... and usually making the problem worse. Eventually, the problem will solve itself if left unmanaged/poorly managed... and then the ultimate result is what we have here today. 20 dead kids from 5-10 shot execution style for NO REASON. The only reason was locked in Adam's head that he blew off... and it probably only would have made sense to a psychotic. His reason was a non-reason. A Hollywood nonsensical fantasy. A cheap Quinton Tarantino horror flick playing out in his head. didn't want it to end this way. Anybody who could harm a child - needs to immediately have their right to breathe card revoked. You are vermin - you are to be hunted. Your body and mind, it's gone empty. God Bless the little ones and their families in gut-wrenching pain out there tonight! No words can express my sorrow. CBB's prayer brought tears to my eyes all over again. Carpe's words are right on. Everyone wants to jump on the knee jerk reaction to ban guns -- that is not the underlying issue. It's the decay of the psyche of America, the decay of the family (and family values) and the general desensitization of our youth from movies and video games that is causing this evil to spread. I certainly understand the calling for a ban on guns -- it's the "caring, compassionate" thing to do -- it makes total sense on the surface. However, it is not quite so black and white. The genie is already out of the bottle -- when you out law guns only the "outlaws" will have guns! Then where are we?!? Newtown, Connecticut (CNN) -- The bodies of children and educators lay where they fell in a Newtown, Connecticut, elementary school -- in classrooms and hallways -- as investigators worked to identity the dead early Saturday while piecing together the path of the gunman. My heart and prayers go out to all those involved and affected by Sandy Hook Elementary School shootings. (CBS News) The bodies of all of the deceased victims of the Sandy Hook elementary school shooting were positively identified by early Saturday morning, according to Connecticut State Police spokesman Lt. Paul Vance. Vance added that the removal of the bodies "has been accomplished. That was done overnight, " he said. "We worked very closely with the medical examiner who was on the scene to expedite the process and were able to accomplish that. "Now state police detectives are continuing the investigation within the building and on the exterior of the building and will continue to do so." Questions remain about the relationship of shooter Adam Lanza's mother, who was also killed Friday. "We haven't discussed that publicly as of yet," Vance said, explaining that those details are "part and parcel" of the ongoing investigation. Authorities said Saturday they have identified the 20 children and six adults massacred by gunman Adam Lanza at Sandy Hook Elementary School in Connecticut and removed the bodies from the school. The families of the dead were gathered at a firehouse in Newtown, where Monsignor Robert Weiss said they were mostly concerned that the children had not suffered in their final moments. “They were wondering whether the children knew what was happening to them, whether they were afraid,” he said. Wielding two pistols and clad in black, Lanza, 20, rampaged through the small-town school Friday morning, apparently after shooting his mother dead at his home. He then shot himself. Several officials told NBC News that he shot the children at close range. Newtown Police Lt. George Sinko said on TODAY it appears Lanza got into the 600-student school by shattering some glass near the doors. Ryan told police that Adam has a history of mental illness, according to the senior official. Yet the motive for the mass killing was a mystery. NEWTOWN, Conn. (AP) — First, he killed his mother. How does socially awkward translate to what happened? I hate to say it but there had to be signs that this kid had gone way over to the dark side. All victims have all been identified, no names yet ready for release. When they are it was requested that the media (all) please respect their privacy for the tragedy that they are currently going thru. This is still a crime investigation and many questions will not be able to be answered by authorities. Three major crime teams in the community investigating the shooting. Evidence from primary crime scene (school) and secondary scene (the Home) produced good evidence to determine why the crime took place. No details provided. No motive provided yet, investigators still working on it and evaluating the evidence. The shooter forced his way into the school. (forcible entry, he was not allowed into the school) Details of how the shooter did this was not provided. No other arrests were made in association with this crime. How sad, I can't watch anymore. I have to wonder how this young man spent his days. Where did he get the idea to do this? Did he practice? Did he play lots of action games? Lot of computer games? On-line games? When a violent mob attacks an embassy, kills Americans, the ABM admin blames a movie preview. A man ends up in jail. How many violent videos did this you man watch? How many games did he play? Do these kinds of ideas come from no where? I don't think so. Any chance the video, movie, game industry will take any flack? How many kids spend their days playing violent action games? I agree that there had to be signs. His mother purchased the guns and they were registered under her name. I'm thinking she purchased them for protection against him. What a bad decision she made in getting those guns knowing he was a lose cannon. During this mornings police press conference in Newtown, CT they referenced that they have evidence to put together a reason and a motive as to why all this took place. I am guess that this kids computer was a treasure trove of info and he, if he is what all are saying, nerdy, intelligent, gamer, etc ... I probably wrote in great detailed account what he was planning, an itinerary and what he needed to commit the crime. You do not commit a crime like this unless you are a psychopath, narcissist and want to go out in a blaze of glory. If he was such a smart kid, compulsive, had personality disorders and no soul ... that is a terrible make up that creates killers w/o a heart. The unhinged gunman who slaughtered 26 children and adults yesterday in a elementary school arrived with guns blazing — blasting his way into the building, according to Connecticut State police. 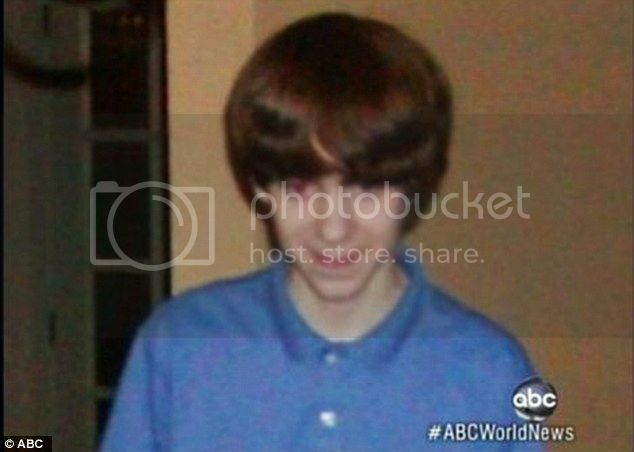 “He was not voluntarily let into the school at all,” Connecticut State Police Lt. Paul Vance said at a Saturday morning press conference outside Sandy Hook Elementary School, where Adam Lanza unleashed one of the worst massacres in US history before committing suicide.